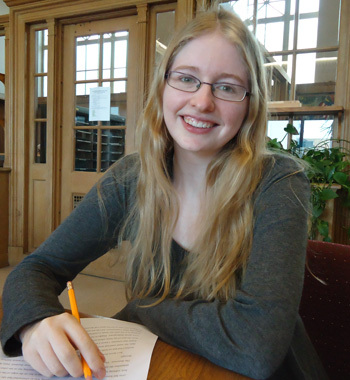 Nicole Hagstorm Schmidt is currently a graduate student at Western Illinois University as well as an English 180 teacher for undergraduate students. She is well known among the students in the graduate program and thought of fondly by the professors in Simpkins Hall. After receiving her Bachelor’s Degree in English in 2009 at Truman State University, Nicole pursued her childhood dream of becoming a master’s student. When I asked Nicole about her decision to become part of a graduate program she responded, “I first idly wanted to pursue a graduate-level degree when I was around twelve years old. I put ‘Dr.’ in front of my last name and thought it sounded incredibly cool. When I first entered college in 2005, I assumed that I would end up pursuing an MAE for secondary English education. One education class was all I needed to determine that secondary education was not for me, though it did give me a new appreciation for my K-12 instructors.” After one obvious sign to change her career path, Nicole tells us that she officially chose to pursue a graduate degree in 2012 after she had been out of school for three years. “It was one of those things where I realized that literary study (discussion, teaching, writing) were large parts of what gave my life meaning and so I threw myself into preparation. I also discovered that research is next to impossible when you don’t have access to databases or regular contact with people who know whether or not you’re making stuff up. I met with Dr. Amy Mossman (the graduate director at the time) in July of 2012, and idly joked that I would be happy to start grad school that fall if they still had spots available. Two weeks later, I was sitting in TA training with some of the smartest and most talented individuals I have ever met.” That began Nicole’s journey into the Western graduate program. Nicole wanted to share some tips with students who are considering graduate school. She addresses our readers with, “For traditional students considering graduate school in the humanities (whether that be an MA, PhD, or MFA), I would strongly advise taking some time off after earning the bachelor’s degree. That extra period of time will make it more clear that advanced study is something that you actually want or need, and not just a diversion tactic.” Outside of using this time for self-evaluation and introspection, Nicole advises prospective students to make contact with faculty members in their field. She says, “It’s the professors who really understand the field and can tell you specifically what kinds of things you should be doing to prepare. An MFA’s preparation is very different from a MA’s in journalism, for example. They will also know how to catch the typical mistakes in an application. It also preps you for the inevitable critiques that will come.” Nicole encourages all students, prospective and current, to use their professors as resources. When asking Nicole about her experiences in the classroom, her enthusiasm was hard to ignore. “Like most instructors I’ve talked to, I love to be in the classroom and I love interacting with my students, but I’m not too fond of the time and emotional energy it takes to grade longer assignments. The most interesting things that have happened this semester include a lesson where students had to sell various products, ranging from a Journey’s Greatest Hits CD, a package of beef-flavored Ramen, and a banana costume.” She is also very proud of the fact that several of her students have won awards for the writing they have done in her class. Aside from her presence in the classroom, Nicole is also known around campus for her work as the former co-president of the English Graduate Organization (EGO). I questioned her about her experience as EGO royalty and she reported, “Overall, I was very pleased with the experience. In the past I had only served secondary leadership positions like secretary (no one ever lets me be treasurer), so it was pretty neat to be running the show, along with the always-amazing Jessica Mason McFadden, of course. I was really pleased with EGO’s 2013 Conference and all the effort that individual EGO members put into the planning and execution of the event.” Nicole passed her presidential hat with confidence onto Alex Ayers and Anjali Pattanayaka, the current co-presidents of EGO. As for her plans after graduation, Nicole is happy to report that she has been accepted to several PhD programs in English Literature for the coming fall, including The University of Arizona, York University, SUNY Buffalo, Flordia State, and Texas A&M. She says, “I have had multiple funded offers and am frantically (but happily!) trying to figure out where is the best fit for me.” Nicole Hagstorm Schmidt is a passionate, creative, and inspiring student and I am confident that she can achieve anything she strives to do. ← What’re You Gonna Do With That?